After several days of drinking Pu-erh and White Peony teas, I'm falling back in love with drinking tea over most other beverages. They're warm and comforting and smell oh so delightful! 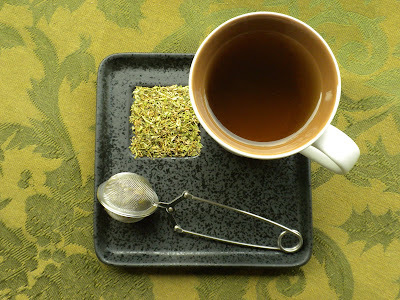 I decided that it was time to introduce a third tea to my Whimsy Diet: Chickweed Tea. Chickweed is a mild diuretic, which means that it helps you to lose excess water weight. You only need 1 cup late in the afternoon. I love this extra cup of tea because I tend to get hungry a few hours after lunch. I could have a snack but, honestly, sometimes I'm too lazy to make one. A hot cup of tea is easy and enough to get me through until dinner. *As with the other teas, I bought this one through Mountain Rose Herbs for $8/lb. With just 1 cup a day, my supply is going to last forever. Plus, think about that water weight. How defeating is it when you know you've eaten reasonably healthy and even made some sort of effort to exercise, yet you feel and look bloated? I'm finding that Chickweed tea is like a little "weight-loss fairy" who has my back when I'm feeling defeated! P.S. Here's my favorite tea wand shown above. I drink a lot of iced tea and not a lot of hot tea. I always think about brewing loose tea but haven't yet. The Chickweed tea would probably be helpful for me. Thank you for sharing your diet secrets! I will certainly try this trick!